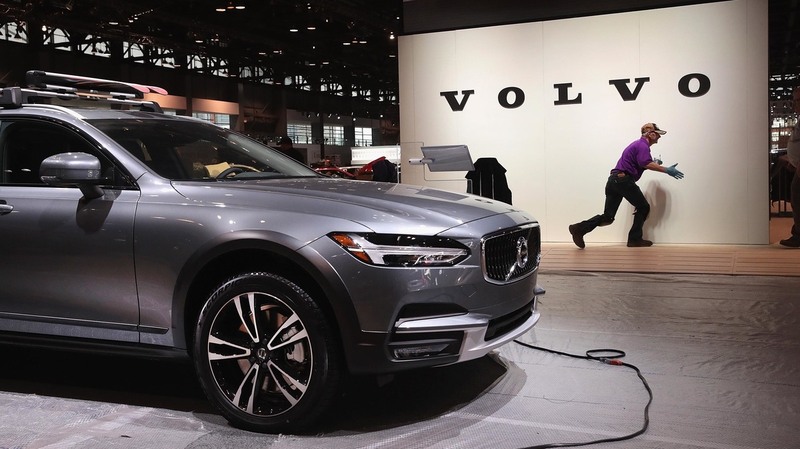 Slow Down: Volvo Will Limit Its Cars' Top Speeds To 112 MPH The carmaker says the change is meant to send "a strong signal about the dangers of speeding" and that the company is also working on new ways to address distracted and intoxicated driving. Volvo said it will limit all its new cars to a top speed of about 112 mph, starting in 2020. Here, workers on Feb. 6 prepare the Volvo display before the opening of the Chicago Auto Show. The days of underground Volvo drag races are limited. No more will practical station wagons meet on empty streets at midnight, drivers revving their engines and eyeing the finish line with steely intent, Birkenstocks slamming down on gas pedals. OK, so the Swedish carmaker isn't precisely known for making hot rods. Still, its S90 sedans and V90 hatchbacks can hit top speeds north of 150 miles per hour, if you pay for the maximum horsepower — that's according to the manufacturer's specs. But not anymore: Starting in 2020, Volvo will limit all its new cars to a top speed of 180 kilometers per hour, or about 112 mph. That speed cap is still significantly higher than the top speed limit in any U.S. state. In a statement released Monday, Volvo said the change is meant to send "a strong signal about the dangers of speeding." Speed limiters are common in some commercial vehicles, like buses and trucks. Cars produced in Japan for local markets feature built-in speed governors, and speed limiters are not unheard of in Europe. But they're not common in private vehicles in the United States. Volvo Cars, which is headquartered in Sweden and owned by the Chinese company Geely, has always emphasized safety in its branding and marketing. It's currently promoting a measure called Vision 2020 that's aimed at reducing the number of people killed in new Volvos to zero by 2020. But tweaks to cars can get the company only so far. Volvo's engineers can't stop drivers from speeding, driving while intoxicated or looking at their phones while they navigate the road. "We want to start a conversation about whether car makers have the right or maybe even an obligation to install technology in cars that changes their driver's behaviour, to tackle things like speeding, intoxication or distraction," Volvo Cars President and CEO Håkan Samuelsson said in the statement. The speed cap on new cars will help address speeding; meanwhile, Volvo is working on ideas for addressing intoxicated and distracted driving.